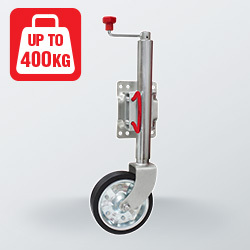 At Richmond NZ, we offer a complete range of castors in a variety of designs and specifications. No matter what industry you’re in, we are confident that you won’t have to look anywhere else for products that suit your needs. Whether you’re looking for heavy-duty caster wheels for trolleys, swivel castors for display equipment, or fixed caster wheels for machinery or heavier objects like shipping containers, you can find it all within our extensive range. Our castors come in a variety of fitting types, weight capacities, wheel materials and sizes. You can find castors fitted with wheels made from rubber, nylon, steel, aluminium or polyurethane. These wheel types are also suitable for a range of applications, such as anti-static, high-temperature, low rolling resistance, shock absorbing and high wear resistance. Furthermore, our wheel and castor range includes pneumatic wheels, designer castors, buffers, castors with brakes, stainless steel castors, fixed caster wheels, swivel castors, adjustable feet, heavy-duty caster wheels, medical castors, floor locks, and more. If we don’t have a wheel or castor in our range that suits your requirements, we also have the ability to work with you to design and manufacture them to meet your specifications. WHY CHOOSE RICHMOND NZ FOR CASTORS? As New Zealand’s leading caster suppliers, you can trust that you’re receiving top quality products that are designed to meet the requirements of the New Zealand market. With over 50 years as castor manufacturers in the wheel and castor industry, you can rely on us for our expertise, experience and unparalleled customer service. For more information on a particular caster, please get in touch with our friendly team today. Call us on 0800 61 71 81 or email us at [email protected] and we will reply to you shortly.